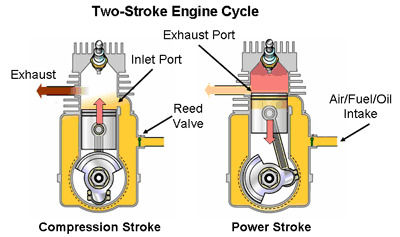 Two-stroke (or two-cycle) engine is a type of internal combustion engine which completes a power cycle with two strokes (up and down movements) of the piston during only one crankshaft revolution. As the name suggests two stroke it has only two cycles.This is in contrast to a “four-stroke engine“, which requires four strokes of the piston to complete a power cycle during two crankshaft revolutions. In a two-stroke engine, the end of the combustion stroke and the beginning of the compression stroke happen simultaneously, with the intake and exhaust (or scavenging) functions occurring at the same time. In a two stroke engine power is produced in one revolution of the crankshaft(360° rotation) where as in case of four-stroke engine power is produced in two revolution of the crankshaft (720° rotation). There are two cycles in two stroke engine. Suction- compression in 1st stroke and Power-exhaust in 2nd stroke. Two stroke engines may be petrol or diesel engines. 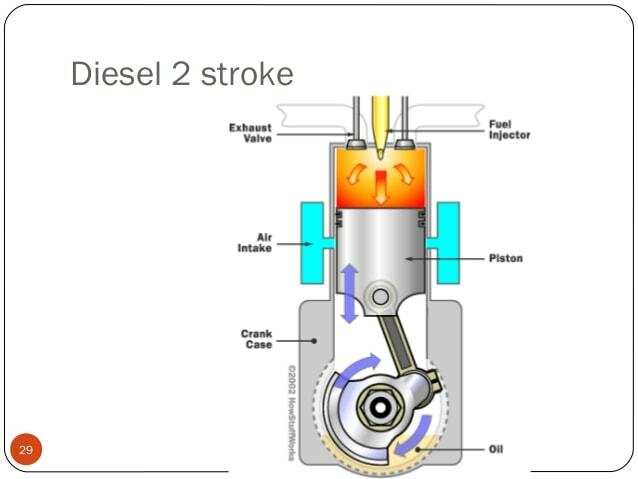 So the working of the two stroke petrol and two stroke diesel engines are somewhat different but the principle is same for both that is there is only 2 cycles. During the upward stroke, the piston moves from bottom dead center to top dead center, compressing the air-petrol mixture in the cylinder. The cylinder is connected to a closed crank chamber. Due to upward movement of the piston, a partial vacuum is created in the crankcase, and a new charge is drawn into the crankcase through the uncovered inlet port. The exhaust port and transfer port are covered when the piston is at the top dead center position. The compressed charge is ignited in the combustion chamber by a spark provided by the spark plug. As soon as the charge is ignited, the hot gases force the piston to move downwards, rotating the crankshaft, thus doing the useful work. During this stroke the inlet port is covered by the piston and the new charge is compressed in the crank case. Further downward movement of the piston uncovers first the exhaust port and then the transfer port. The burnt gases escape through the exhaust port. As soon as the transfer port opens, the compressed charge from the crankcase flows into the cylinder. The charge is deflected upwards by the pump provided on the head of the piston and pushes out most of the exhaust gases. It may be noted that the incoming air-petrol mixture helps the removal of burnt gases from the engine cylinder, which is called as the scavenging process. If in case these exhaust gases do not leave the cylinder, the fresh charge gets diluted and efficiency of the engine will decrease. The cycle of events is then repeated. In a two stroke cycle diesel engine, only air is compressed inside the cylinder and the diesel is injected by an injector. There is no spark plug in this engine. The remaining operations of the two stroke cycle diesel engine are exactly the same as those of the two stroke cycle petrol engine. During the upward stroke, the piston moves from bottom dead center to top dead center. It compresses the air in the cylinder. The cylinder is connected to a closed crank chamber. Due to upward movement of the piston, a partial vacuum is created in the crankcase. A new charge is drawn into the crankcase through the uncovered inlet port. The exhaust port and transfer port are covered when the piston is at the top dead center position. The compressed charge is mixed with the injected diesel. It gets auto-ignited in the combustion chamber because of the high pressure and temperature present. As soon as the fuel is ignited, the hot gases force the piston to move downwards, rotating the crankshaft, thus doing the useful work. During this stroke the inlet port is covered by the piston and the new charge is compressed in the crank case. Further downward movement of the piston uncovers first the exhaust port and then the transfer port. The burnt gases escape through the exhaust port. As soon as the transfer port opens, the compressed charge from the crankcase flows into the cylinder. The charge is deflected upwards by the pump provided on the head of the piston and pushes out most of the exhaust gases. It may be noted that the incoming air helps the removal of burnt gases from the engine cylinder, which is called as scavenging process. If in case these exhaust gases do not leave the cylinder, the fresh charge gets diluted and efficiency of the engine will decrease. The cycle of events is then repeated. Old vehicles are generally seen with two stroke engines. Useful in chainsaws, Weed-eaters, outboards, lawnmowers ,etc. They are lighter in weight and they can also produce a higher power-to-weight ratio. Two-cycle engines are also easier to start in cold temperatures. Useful in small applications like chainsaws, Weed eaters, outboards, lawnmowers ,etc. Can work in any orientation as there is no oil reservoir. Mechanical simplicity, design is not complicated. It creates more pollutants and harmful gases. Because, the two stroke lubricating mixture is also burned in the engine. Wear and tear is more in this engine as there is no lubricating system.